Giorgione’s Three Ages of Man is another one of his paintings that has so far eluded identification. The name of the painting that now hangs in the Pitti Palace is pure guesswork stemming only from the obvious disparity in ages of the three men. One appears to be about 60, another in his early thirties, and the last a young man in his teens. He even guessed that the boy carried a flute in his hidden right hand. It is difficult to see how the sheet of paper can be identified as a sheet of music. Even under magnification there are no discernible musical notations nor recognizable words. Neither Humfrey nor Eller offered an explanation. 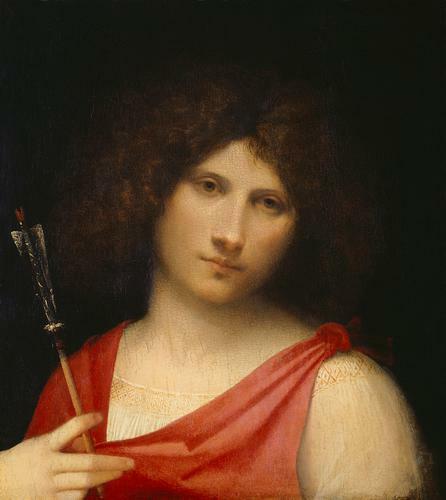 Eller referred to a description of a painting in a 1569 inventory of the collection of Gabriele Vendramin. “Un quadro de man de Zorzon de Castelfranco con tre testoni che canta.” Yet, none of the figures in the Pitti painting are singing! 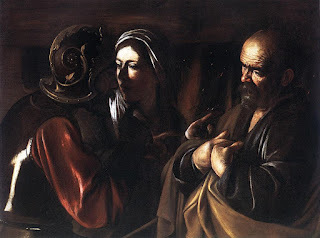 As far as I know no one has suggested that the painting has a “sacred” subject, but yet, it appears that Giorgione has depicted a scene from the nineteenth chapter of the Gospel of St. Matthew. It is the story of the encounter of Jesus with the young man of great wealth. 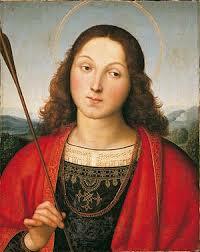 In Matthew’s account the young man asked Jesus what he could do to attain eternal life. Jesus told him to keep the Commandments, and specifically named the most important. The man replied that he had done so but still felt that something was wanting. 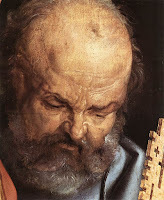 Jesus then uttered the famous words,“If thou wilt be perfect, go, sell what thou hast, and give to the poor, and thou shalt have treasure in heaven; and come, follow me.” The gospel relates that the young man went away sad for he had many possessions. 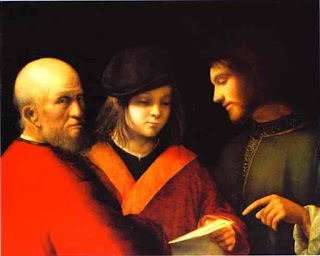 How has Giorgione depicted this story and who is the third man?The man in the middle is obviously young and the golden lapels of his garment as well as his fashionable hat indicate that he is well to do. He is holding a piece of paper or parchment that contains some indecipherable writing that under magnification hardly looks like Renaissance musical notation. Giovanni Bellini and Albrecht Durer, both Giorgione contemporaries, depicted Peter’s head in this fashion. 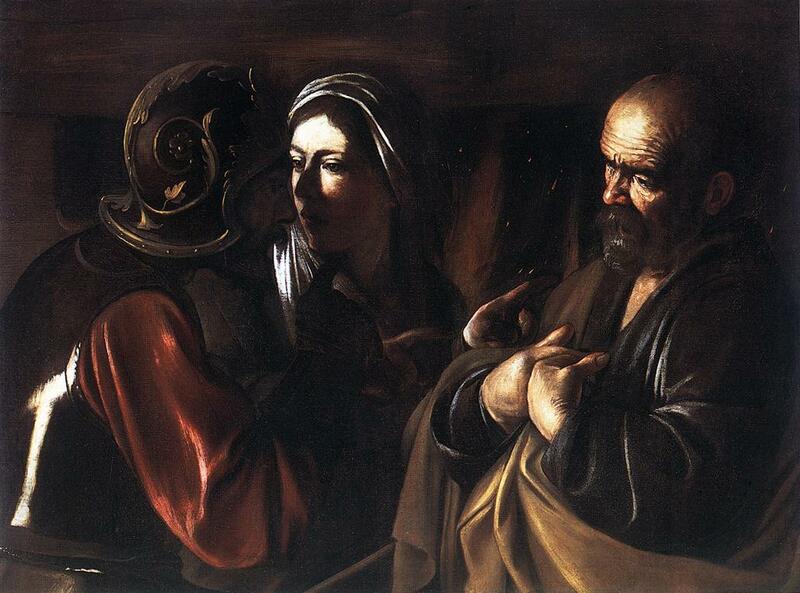 About a hundred years later Caravaggio still used it in striking fashion in the Martyrdom of St. Peter in S. Maria del Popolo in Rome, and in the Denial of Peter now in New York’s Metropolitan Museum. In the first decade of the sixteenth century Venice was at the apex of its glory. It would suffer a great defeat at the end of the decade during the War of the League of Cambrai but until that time it was arguably the wealthiest and most powerful of all the European nations. It was certainly the only one that dared confront the mighty Ottoman Empire. Peter and the other disciples were shocked when Jesus said that it would be harder for a rich man to enter the kingdom of heaven, than for a camel to pass through the eye of a needle. “Who then can be saved,” they asked. The response of Jesus was full of hope: “With men this is impossible, but with God all things are possible.” Green, the liturgical color used throughout the Church year, is also the color of hope. 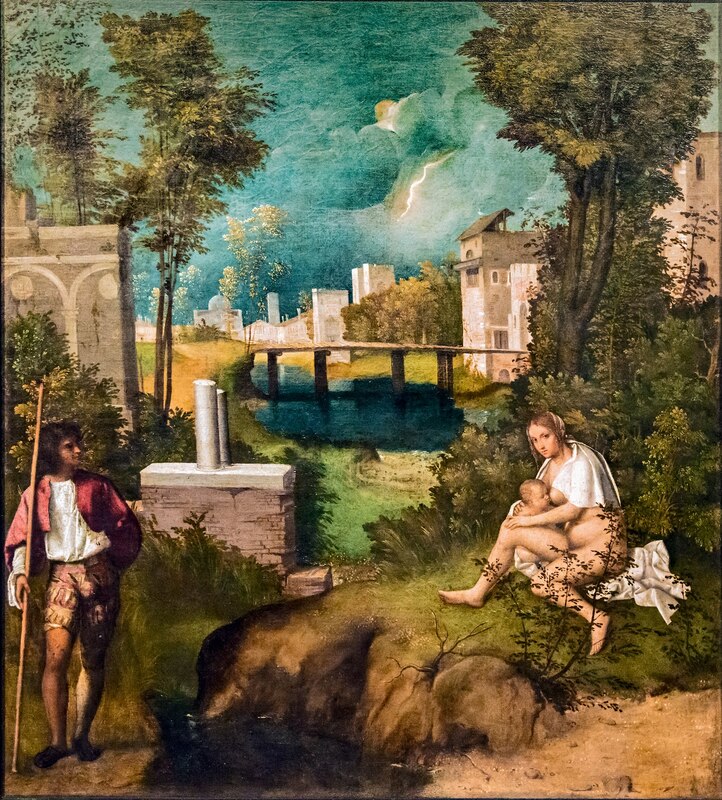 * This interpretation of Giorgione's "Three Ages of Man'' first appeared on Giorgione et al... on Oct. 8, 2011. 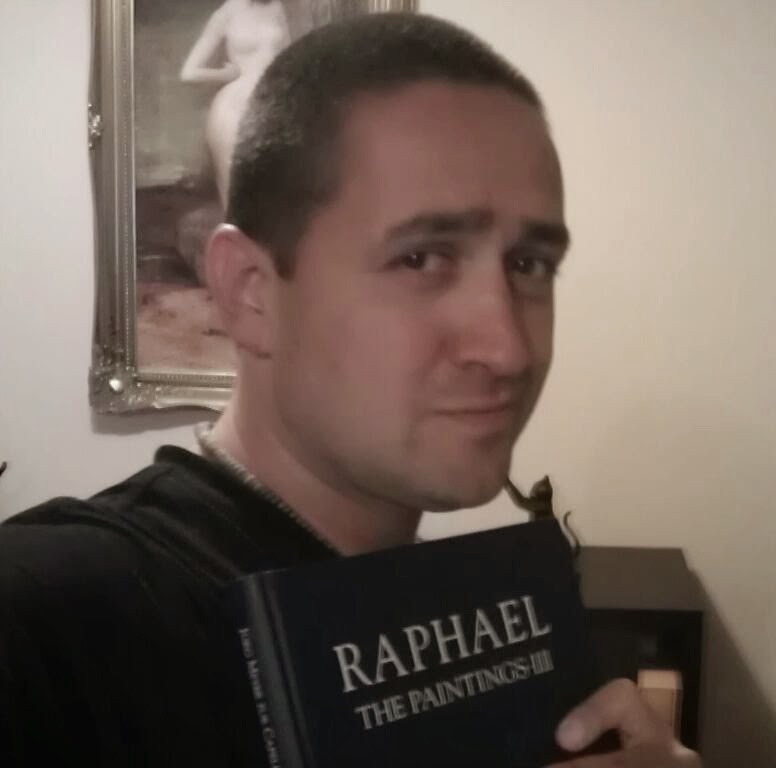 My wife and I saw the painting when we visited the Pitti Palace in 2017. In the past few years I have seen nothing that would make me change my opinion of its true subject. [i]Peter Humfrey, Painting in Renaissance Venice, Yale, 1995, p. 124. [ii]Wolfgang Eller, Giorgione, Catalog Raisonne, Petersberg, 2007, p. 45. [iii]Dom Jean LeClercq, Camaldolese Extraordinary, The Life, Doctrine, and Rule of Blessed Paul Giustiniani, Bloomingdale, Ohio, 2003, p. 61-62. 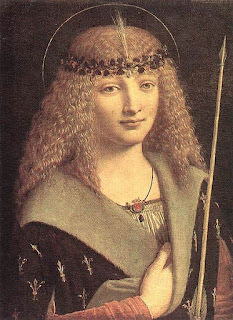 Although few followed the extreme example of Tommaso Giustiniani, his attitude was not unusual. See Margaret L. King, Venetian Humanism in an Age of Patrician Dominance, Princeton, 1986, pp. 240-241.